A pesticide is a chemical that is used to kill or prevent small animals (or organisms) which are considered to be unwanted. These organisms are called pests. Some of these pests that people do not want are insects, microbes that destroy plants, and other things that affect humans in a bad way and it may kill humans too. Many pesticides are poisonous, and are bad for not only the organisms they kill, but for humans too. 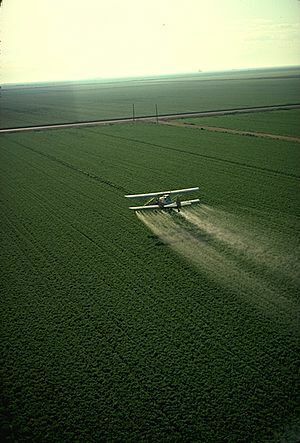 A pesticide also affects the environment and the atmosphere. The Stockholm Convention on Persistent Organic Pollutants lists chemicals that are very hard to destroy, or very toxic. In total, twelve chemicals are listed. Nine of them can be used as pesticides. There are different types of pesticides for getting rid of different pests. Pesticides are used to kill pests, but many are bad for human health. They may pollute water, and go into rivers, lakes, and ponds. This will cause acid rain, and organisms living in the water can get sick and die, because the water where they live has more acid. Pesticide runoff is very bad for animals, especially amphibians. Use of polycultures, that is growing many different crops together, rather than just one crop. A sign warning about potential pesticide exposure. 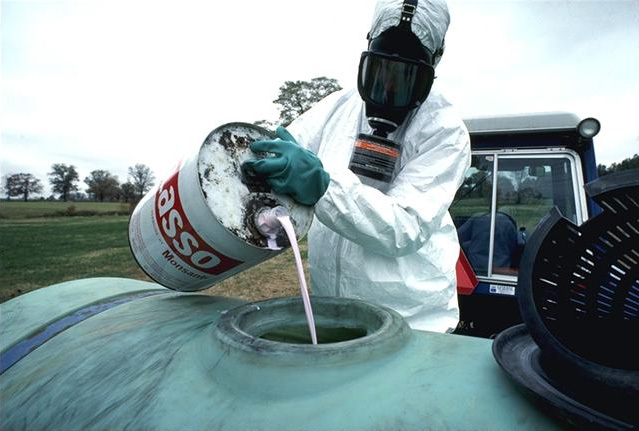 Preparation for an application of hazardous herbicide in USA. Pesticide Facts for Kids. Kiddle Encyclopedia.